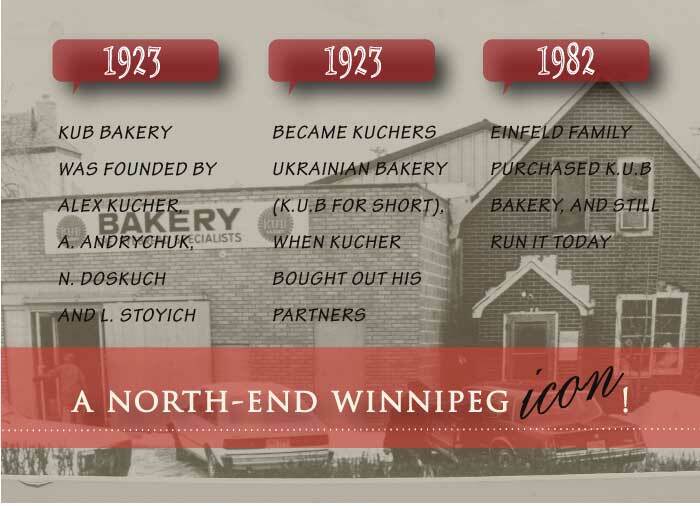 KUB Bakery has been Winnipegs Rye Bread specialists for over 80 years! KUB Bakery, the oldest rye bread bakery in the city, has been making Winnipeg-Style Rye bread, using virtually the same recipe since 1923. A north-end Winnipeg icon, KUB BREAD is synonymous with wedding socials, and a uniquely high quality Winnipeg-style product. KUB Bakery has been a proud supplier to the Winnipeg Arena (Winnipeg Jets), MTS Centre (Manitoba Moose) and Shaw Park (Winnipeg Goldeyes) for many years. We are also proud to have donated over million dollars worth of product to Winnipeg Harvest, and other local food banks. KUB Bakery was the proud sponsor of the largest social ever – Manitoba Homecoming. We regularly ship product all over the world for people longing for a taste of home.